We all have that one top in our wardrobe that’s The Top. The one we’ll pair with anything. Just got a new pair of pants? The first time we wear them will be with The Top, so we know they’ll look their best. We want to go bold with our makeup? The Top will keep us from going overboard. It’s a reliable friend that we don’t mind calling on again and again because it delivers fabulousness every single time without issue. Don’t have one? Well, that’s all about to change. The Express Silky V-Neck Gramercy Tee is the ultimate version of The Top. It’s the top of all tops. It’s a simple, silky, versatile V-neck that has so much more to offer than meets the eye. We are, however, definitely liking what’s meeting our eye. Even better? We can currently buy one and get another for 50 percent off! If we’re not careful, we’re never going to wear our other tops again! See it: Check out the Silky V-Neck Gramercy Tee for $40 and get a second for half off while this BOGO 50% off offer lasts at Express! Shoppers are calling this top a “must-have” wardrobe staple, one even reporting that they bought “too many to count.” Others commented on how it “compliments without clinging,” falling into an easy, flattering shape that won’t have us readjusting all day or night. Many shoppers agree that it has an expensive and sophisticated look, especially when dressed up! How many of our T-shirts would we honestly describe as “sophisticated”? Exactly. This top’s silky fabric drapes gracefully and comfortably down our torso, its shirttail hem hitting at the hip for a near-tunic length. This means it’s a perfect length for tucking into high-rise bottoms, or letting hang freely over leggings or culottes. Getting dressed just got even easier with this top! The V of the neckline dips deeply, but always keeps a toe in the shallow end, not dipping so deeply that we’ll need body tape to keep it in place. This top can function as party or professional attire and no one will question if it suits the occasion. We can, of course, also wear it casually! How about getting started with these denim leggings? This upgraded tee also has cuffed cap sleeves, featuring extra silky accents. Just the sleeves being capped gives this top an entirely upgraded vibe from a basic cotton tee. The neckline also has a thin outline of the shiny accent fabric, creating a little extra glimmer regardless of whether we’re wearing a necklace or not. This top of all tops is available in three colors, which are as versatile as the shape of the shirt. Pitch black is a pure black with no hint of color, meaning it won’t look awkwardly mismatched under bright lighting if we wear it with other dark pieces. 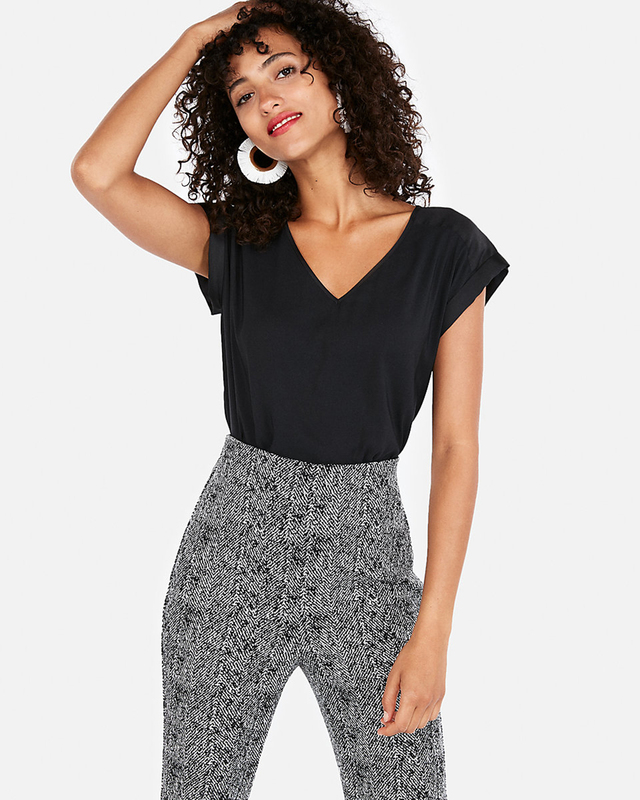 We can pair this black top with a black midi-skirt, a pair of heels and an updo for a no-fail option if we’re a guest at a wedding, going out to a nice dinner or attending a classy event. Don’t forget a clutch! Tan is a soft, light taupe shade. It’s a great color to pair with black while still keeping things low-key. We also think this would pair beautiful with gold, or even rose gold jewelry. Layer up the bangles and a pendant-choker for a look that’s both upscale and edgy. We’re picturing a getup to wear out to evening drinks with friends that will have us ready to pose when someone inevitably wants to take a group shot. The ivory shade creates a clean slate for our outfits, on which we can layer color. A bright red lip or a colorful faux leather jacket are awesome go-to options for layers, but we can also play with a denim skirt or high-waisted black shorts and maroon or navy tights, for example. Whatever colors or patterns we’re loving at the current moment, the Ivory top will work with us to make them happen and let our pops really pop. Whether we’re “stepping out or kicking back,” any color of this top will fit both us and the location we choose to wear it to. Don’t miss out on this sale, because the only thing better than one “must-have” top is two! Or more, obviously. See it: Check out the Silky V-Neck Gramercy Tee for $40 and get a second for half off while this BOGO 50 percent off offer lasts at Express! Not your style? Check out other blouses from Express here!